Italy's best-loved screen and style icon, Sophia Loren, will celebrate a significant anniversary this week. Set to turn 80 years old on September 20th, astonishingly, nothing much has changed. Despite many lovelorn offers (from co-stars Cary Grant and Peter Sellers, among others), unusually in the fickle world of showbiz, she instead maintained her one and only 50-plus-year marriage. She works when she wants to; she dotes on her children and grandchildren; she appears regally at red carpet events. Looking every inch the naturally glamorous movie queen - from still enviable hourglass figure to heels - she eclipses so-called stars half her age. She is the ultimate role model not just for older women, but perhaps Everywoman. We look at her life and her most famous quotes for a glimpse of her secret. ‘Screen goddesses are rare enough, but celluloid divinities who can act are a breed apart.’ Robert Pardi, on The International Dictionary of Films and Filmmakers. 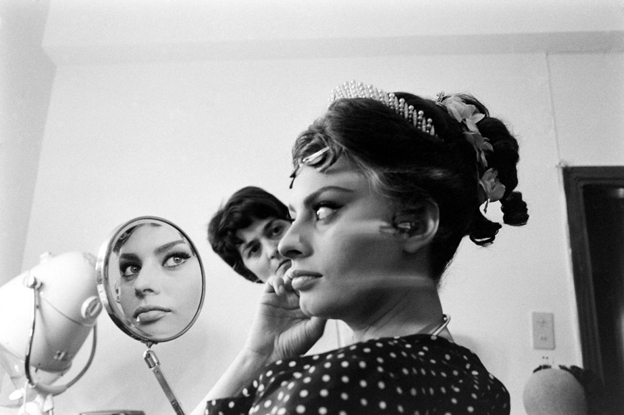 Sophia Loren is the self-professed ugly duckling who, at 14, blossomed into the proverbial beautiful swan. Called giraffe and stuzzicadente (‘toothpick’) at school, she would become known as the world’s most beautiful woman. The shy girl whose talent transcended a background of extreme poverty in war-torn Pozzuoli, near Naples, to illuminate half a century of Italian, French, and Hollywood film. She has acted alongside Hollywood greats including Charlton Heston, Marlon Brando, Clark Gable, and Charlie Chaplin. Just some memorable films span Quo Vadis, El Cid, Aida, The Gold of Naples, rom-com Houseboat to later favourites, 1994’s Pret--Porter and 2009’s musical Nine. If the life shows in the face, la Loren wears past cares with ease. Even divas have their problems – and she has faced her fair share with some dignity and a mantra of ‘moving forward, never looking back.’ Once condemned by the Vatican and authorities for her first ‘illegal’ marriage to Carlo Ponti, who can forget her 18-day prison sentence for (alleged) ‘tax evasion’? Just two major milestones to never leave a visible mark. The first female celebrity to premiere her own perfume, ahead of her own eyewear range, she was the perfect person to pen her own beauty book. Thirty years on, the advice remains as timeless as its author. Written before botox and cosmetic surgery were de rigeur, practical tips include taking a daily walk; using cold-pressed olive oil as make-up remover and moisturiser; cultivating ‘internal beauty’, and the right attitude in coming to terms with age. Rather like the Signorina of rare star quality herself… She is perhaps the best personification of a wonderful Italian adage: that women can be considered beautiful no matter what age they are if they take care of themselves. As such, we salute Sophia, the magnificent matriarch of movies! ‘Sometimes, with exercise for example, I avoid action until I am almost sick with guilt. Then at the last moment before I sink into despair, I give myself a sort of mental slap and say "OK, girl, you'd better get going right now or all is lost!" Further reading: Her first memoir, “Yesterday, Today, Tomorrow: My Life”, published by Atria, is out December 2014 and can be pre-ordered; “Women and Beauty”, 1984, and “Recipes and Memories”, 1998, are also available from our shop.